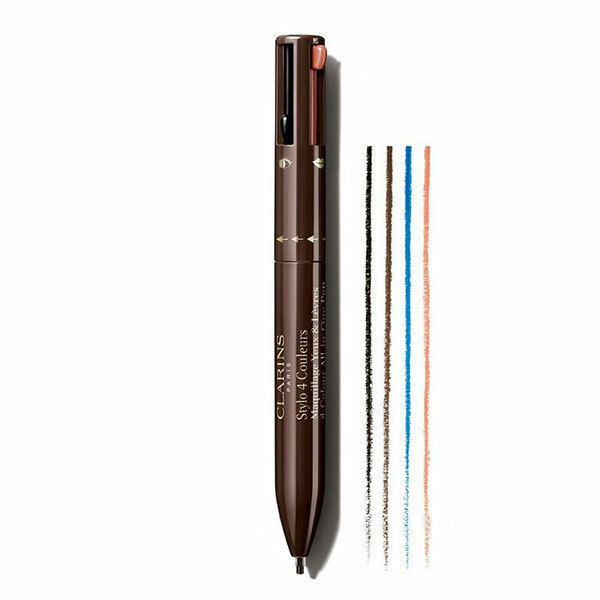 Clarins have brought out a genius product - the 4-colour pen! Just think back to your school days when we all, at some point, had the 4 colour pen and you clicked whatever colour you wanted to use (who ever used the green one?! - unless you were doodling of course!). Well the Clarins 4-Colour Pen is exactly the same principle. It's an all-in-one pencil for the eyes and lips, so brilliant to travel with or throw in your handbag to take your eyes from subtle daytime brown eyeliner to darker sultry black rimmed eyes for the evening. You can even re-apply your lipstick with the natural beige toned lip liner that comes with the pen. The idea is that you have one pen with four products, instead of searching in your makeup bag for 2 or 3 different items. There are 3 tips for the eyes in black, brown & indigo blue and one for the lips in a natural beige colour (so keeping it neutral to work with most lipstick colours). This product is not a gimmick because the quality of the pencils are fantastic, easily applied with no dragging and they smudge brilliantly. They are enriched with sunflower, jojoba and black acacia waxes. A very compact and clever design, I'm just surprised that no else has came up with this before now - well done Clarins! Watch the short clip below showing you the 4-Colour Pen in action, with a few extra tips!